This article is 2617 days old. Across the border, the Detroit Red Wings recently set a new NHL record after winning 21 consecutive home games. Back home, the Windsor Spitfires are still struggling on Thursday nights, losing 4-3 this evening to the Plymouth Whalers. At the beginning of the first, it seemed as if Windsor would overcome the odds and come out on top. Despite an early 2-on-1 shorthanded Plymouth goal by Stefan Noesen, the Spits dominated for most of the period. They retaliated less than a minute later. Brandon Devlin made a blind pass out front to Jordan Maletta, and he let a low wrist shot go that beat Whaler goalie Matt Mahalak. The Spits continued their offense, keeping the pressure in the Plymouth zone. As a result, Nick Ebert scored after skating around a Whaler player and shot the puck over Mahalak’s glove. Towards the end of the period, Maletta found himself in the penalty box with a double-minor for checking from behind. Windsor, however, did a great job killing the penalty, and drawing another as period ended, nullifying the end of the double minor. After one, the Spits lead 2-1, outshooting the number two team in the league 19-7. In the second, it was the same story of woe for the Whalers. Windsor came out on fire, and all over Plymouth to start the period. Because of the constant offensive force, the Spits drew a penalty. Though they did not make the most of the man advantage, they cycled the puck magnificently and kept control. But it was the opposition who struck next, tying the game at 2. After captain Beau Schmitz’s shot on net, the puck bounced up and landed elegantly in front of Danny Vanderwiel. 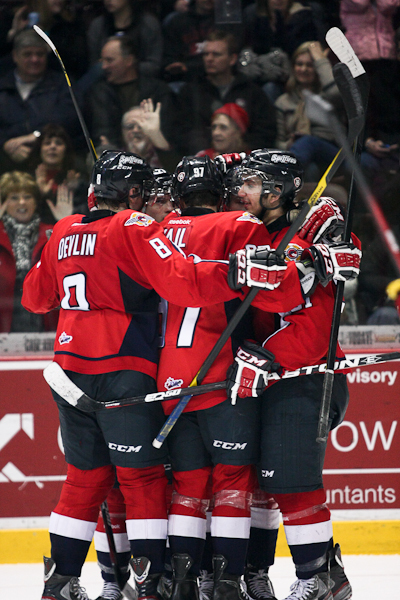 Regardless of the equalizer, the Spits continued their pressure until the buzzer sounded. Once again, in the third period, Windsor seemed to have Plymouth’s number. The Spits skated hard, but their play was cut short on a 5-on-3. Rickard Rakell managed to get the puck across the crease to Jamie Devane who simply tapped it in. However, the home town boys did not sit back. Jeff Braithwaite picked up the loose puck and his slapshot sped behind Mahalak. Windsor had a chance to take the lead after a Plymouth penalty, but could not make the best of it. It was with 2:25 remaining that the Whalers would take control with the eventual game-winner. As Colin MacDonald entered the Spits zone, a Whaler player lifted his stick in effort to tip the puck, but missed. The distraction was enough to have goalie John Cullen go down early, anticipating the tip. The puck was never touched, and it made its way over the glove. With time ticking down, Windsor tried and tried. Brady Vail barely saved a clearing attempt as he stretched his stick at the blue line. There was lots of scrambling, but because Plymouth held the puck against the boards for the remaining seconds, Windsor was stuck. It was good pressure by the Spits, but in the end, Plymouth held on for a 4-3 win in front of a crowd of 5656. Windsor’s next home game is this Saturday, February 18th at 7:05pm when they face the Owen Sound Attack.